We can always do our part for charity by volunteering our service. But there are people who are too busy with work or family and time is a luxury. In this case, donating household items to charity is the best way to help people in need. You don't need to be rich, all it takes is a weekend to sort out your household items so that you don't get rid of stuff which you need. Deciding where to start is often the hardest part. To get you organized, you can first look for items which are just sitting around the house collecting dust. They may include gifts which have sentimental value but of little practical use in your family. Also, when you buy new items, like clothes or books, some old stuff can be donated to charity. This stops you from accumulating things in your house which you will not be using again. There are many household items which can benefit the needy. Some examples are given below but they are not exhaustive. Don't tell me you don't have any old clothes to give away. You may have outgrown your clothes, or you dislike them after going out of fashion. If you look harder, you may even find clothes which you bought in some sales donkey years ago and they have never been worn. Instead of thinking if you will be wearing them soon, why not do some good deeds by packing all these clothes up and donate them to charity. At least you have new excuses for going on shopping trips again. You can donate food to charity, provided they are not stale or expired. I usually donate tinned food like sardines, baked beans, peanut butter, and buscuits when I buy in bulk and cannot finish the food before expiry date. Books are the easiest and most well-received items. For books which you bought but found the content distasteful or uninteresting, why not donate it to charity? If you read a book and won't be reading it again, they can also be cleared off the shelves. You can donate old furniture (like worn out tables and chairs) as people can polish or fix up by themselves. If you have big items like sofas, I recommend neighborhood goodwill stores as they may pick up your larger donations for you. The money is sometimes used to support programs that help put people back to work. 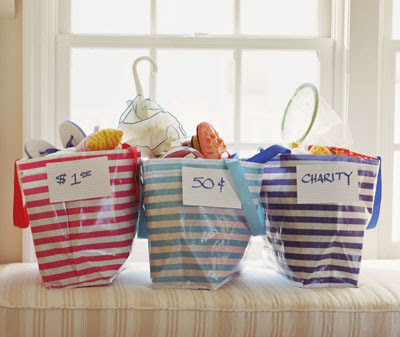 When you donate household items to charity, it also helps to clear up the clutter in your house. You can even claim tax deductions. For example, when you donate household items to goodwill stores, the clerks will usually hand you a slip which you use for the tax credit. With so many benefits, I believe you should make sorting out and donate household items to charity your new year resolution for 2010.